EB’s Spring 2015 festival season kicks off with indie pop greats and jazzy DJ legends. We’re counting down the days till February 27, the date of our first concert of EB’s spring festival season. 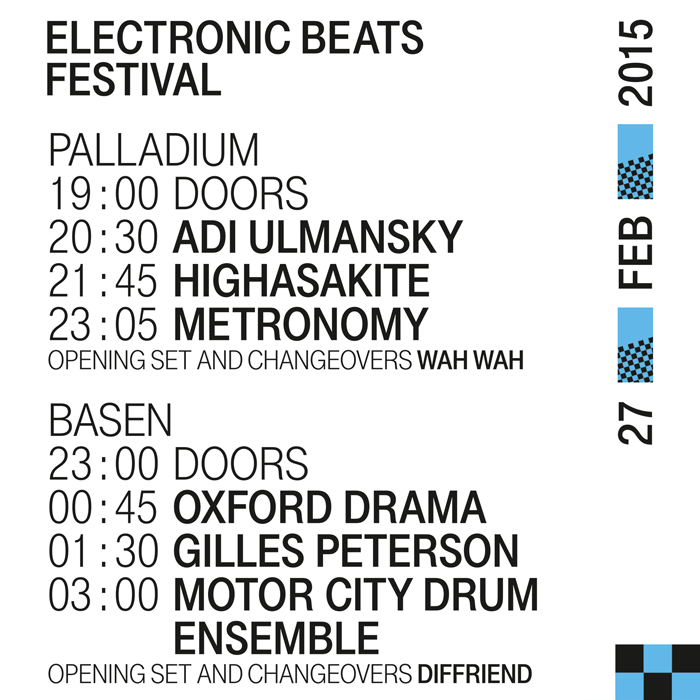 Our first stop will hit two separate venues in Warsaw: the Palladium and Basen. We’re taking over the Palladium at 20:00 with a roster of indie pop and electro greats headlined by British electronic band Metronomy. The savvy foursome has been going strong since Joseph Mount launched the project from his bedroom in Devon, England, which culminated earlier this year with an extended full length titled Love Letters. 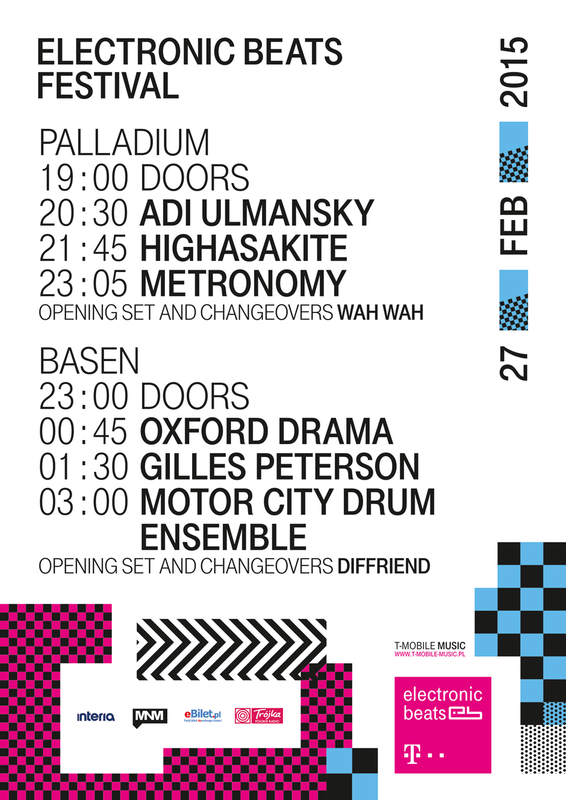 Update: We’ve added Oxford Drama to the lineup at Basen, as well as two local DJs: Wah Wah, who’ll be warming up the Palladium gig, and Diffriend, who’s opening at Basen. We’ve also revealed the running order, which you can peep below. They’ll be joined by Norwegian group Highasakite, who have won over artists like Bon Iver and Coldplay with their captivating live shows. Their latest LP, Silent Treatment, arrived in February and delivered another batch of catchy melodies and prog-pop influences. And rounding out the Palladium lineup this year is Adi Ulmansky, the Tel Aviv-based star of our recent TMTS workshops at Berlin’s funktastic Funkhaus studios. The one-woman act has plenty of experience hammering out pop hooks and prim rap verses over engrossing post-everything beats and bright, textured synths. We’ve been trying to get her Borgore collaboration “Was It You?” out of our heads since she showed us the video at Funkhaus. While our electro-pop extravaganza rages on at the Palladium, BBC Radio host Gilles Peterson will headline our groovy house blowout at Basen starting at 23:00. Peterson’s Searching for the Perfect Beat show and his record labels (Brownswood, Acid Jazz, and Talkin’ Loud) have been responsible for breaking some of the biggest trends and artists in music since the 1990s, including Erykah Badu and Roni Size. He’s a veritable encyclopaedia of all sounds jazz and groove from around the world and a serious legend. Supporting act Motor City Drum Ensemble also imbues his beats with a healthy dose of jazz and soul. The producer and DJ was born Danilo Plessow in Stuttgart, and his output captivated Peterson, among many smitten thousands of fans who have seen him perform live or heard one of his engrossing mixes. One such set is his flawless DJ-Kicks CD from 2011, which opened with a Sun Ra classic and ventured into deep house and techno with a taste for jazz and rhythm. Tickets to both EB Festival events in Warsaw can be found in the Ntry form below. The official hashtag for social media is #electronicbeats. Book your exclusive festival package to Warsaw with our partners at Festicket.